The Kremlin has resorted to obfuscating the past in the name of national reconciliation. Reducing the meaning of the Bolshevik Revolution — a series of events that had enormous impact on Russia and the world — to its significance for national unity is well suited to Putin’s nation-building project. After the disintegration of the Soviet Union, Russia’s territory shrunk, its sphere of influence was gone; its economy was in permanent downfall, and its politics torn by fierce rivalry that led twice to state coup attempts. When Putin became Russia’s acting president in 2000, he saw his mission in consolidating political power and improving economic development. Russia needed to build a new state identity after its imperial statehood was lost. It is hardly surprising that concern about national reconciliation and unity has been fairly high on Putin’s list of priorities since very early in his presidency. In his programmatic Millenium article, published in late December 1999 when Putin was preparing to act as Russia’s president, he wrote that “fruitful, creative work” for the benefit of the fatherland “is impossible in a society that finds itself in a condition of division, internally separated.” In order to “make the new, market mechanisms work to full capacity”, Putin wrote, Russia needs to “overcome the still deep ideological and political split in society”. Putin would return to this theme repeatedly in later years. In 2012, for instance, when he was about to start his third presidential term, he referred to “a civil war… ongoing in the consciousness of many people”, and emphasized the need for “subtle cultural therapy”. Putin’s “civil war” metaphor evoked the memory of the bloody fratricidal war that followed the Bolshevik revolution. But in his pursuit of national reconciliation, Putin apparently seeks to overcome the “grudges, anger and bitterness” caused by another major upheaval of the 20th century — the collapse of the Soviet Union, which he, rightly, sees as a national trauma. Back in the late 1980s and the early period following the disintegration of the Soviet Union, it was common to trace Russia's national trauma to the Communist terror. The remedy to Soviet society’s ills was to be found in the exposure of dark truths about the Communist regime, and Russia was inundated with evidence of Communist crimes. Truth, however, failed to bring reconciliation. Disclosures about Communist crimes increasingly left people indifferent or resentful. And since very early in his presidency, Putin has resorted to another remedy — that of obfuscation and oblivion, a reconciliation without truth. In 1999, the dominant popular sentiment in Russia was profound disillusionment with market reforms and deep distrust of all government institutions. Russia’s first president Boris Yeltsin saw his popularity drop to single-digit numbers; he narrowly escaped impeachment, stepped down and anointed Putin as his successor. 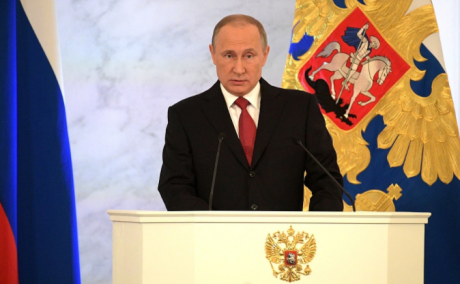 Inheriting Russia in a state of misery and political turmoil, Putin responded to public frustration by re-instating Russia’s “traditional order” — he re-established centralised political controls and eviscerated the nominally existing checks and balances. In the words of Russia’s leading pollster Aleksandr Oslon, Putin “let the river revert to its authoritarian course.” “You can't go against the tide for too long,” he added. 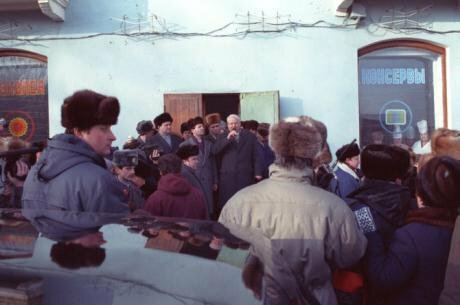 Boris Yeltsin on a visit to Novozybkov, Bryansk Region, in January 1992. Photo: Yeltsin Center. Some rights reserved.Putin saw the societal divisions and confrontational politics as hurdles that had to be removed, but he was not an ideological leader. He sought to calm the passions unleashed by the political and ideological turmoil of the 1990s — yet his reconciliation policy was not about offering a unifying idea. Instead, the Russian president marginalised discussions of divisive and disquieting subjects, such as Stalin’s crimes, or the revision of the USSR policies in Europe before and after the Second World War, or excessive criticism of his government’s performance. Putin capitalised on the Russian people’s yearning for stability after the turbulence of the 1990s. And his immense stroke of luck in the form of the steadily growing price of oil greatly facilitated his task of taking politics under control, muffling the existing differences and keeping people acquiescent and demobilised. National television thus shaped the image of Putin as the country’s leader to whom there was no alternative, and put a strong emphasis on World War Two; national celebrations of the 9 May Victory Day got grander by the year. But beyond that the Kremlin paid little attention to nation-building. 7 November, the day of the Bolshevik Revolution that for seven decades had been the Soviet Union’s ”origin myth”, remained a holiday. The Communist Party of the Russian Federation still celebrated it as the day of the revolution. Officially, however, it had been renamed back in the nineties the Day of Reconciliation and Accord, but there was no publicly shared narrative of a “reconciliation” associated with that date. 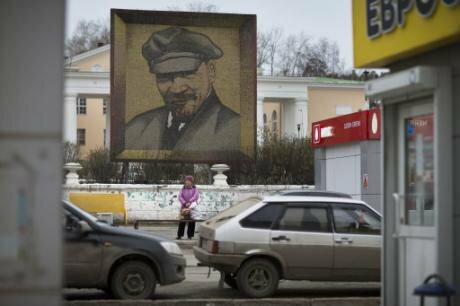 In Russia, the place of Lenin's interment remains a political football. (c) Alexander Zemlianichenko AP/Press Association Images. All rights reserved.In order to strip the Russian Communist party of the “monopoly” on the November holiday, a new one, (4 November) was introduced in mid-2000s. It concerned events in the early 17th century and was titled the Day of National Unity, but no clear narrative was offered this time either. Nor did the Kremlin care to explain why after celebrating “national unity” on 4 November, the Russian people should be celebrating “accord and reconciliation” three days later. In late 2011, the public’s general quiescence gave way to mass anti-Putin protests in Moscow and other large urban centers. The government switched to a more repressive and “ideological” gear, condemning the protesters as immoral and unpatriotic and pitting the more conservative majority against them. Besides, the economic slowdown meant that the government could no longer afford generous social spending, and “ideological” tools came in useful as a substitute source of legitimacy. Putin’s nation-building project gained new urgency after the Ukraine crisis and the annexation of Crimea. Russia became a ”fortress under siege” surrounded by the western enemy. Rallying round the leader was not just a matter of loyalty, but of national security and even national identity. To be a true Russian was to support Putin and celebrate the return of Crimea to the Russian fold. To feel otherwise was to be un-Russian, unpatriotic, maybe even a traitor. The rallying effect remained in place even after the propaganda campaign grew less intense. The nation-building effort assumed a more peaceful course. The unified concept of teaching history that in the 2000s had been often talked about, but not implemented, was commissioned by Putin and soon approved under his watch. The first school books based on this new concept have been published in time for the current academic year. Putin’s reluctance to discuss the causes and meaning of the Bolshevik Revolution is part of his nation-building strategy, which condemns opposition to the existing political order and keeps “difficult” historical issues blurred or unheeded. This counter-revolutionary discourse has it that autonomous public action can only lead to bloody tragedies and should be avoided at any cost. Indeed in recent years the government has waged a campaign against autonomous non-government organisations, and demonstrated intolerance toward public activism deemed even remotely “political”. Over three dozen participants of a 2012 peaceful mass rally were prosecuted; about twenty were convicted, some from 2.5 to 4.5 years in jail. The schoolbooks are not fully silent on the dark pages of the Russian history, but they are thoroughly counterbalanced by brighter developments, lest they undermine the government’s legitimacy.
. Putin’s aforementioned warning against opposing the government looms large in the history park called Russia. My History, which recently opened in Moscow. The infallibility of the ruler is the exhibition’s main theme: pre-revolutionary Russian history is presented as an unabashed eulogy of all Russian czars and princes. Those who ever rose up against the monarchy — from peasant rebels of the 18th century to the members of the aristocratic Decembrists uprising in the early 19th century or the members of the People’s Will revolutionaries in the 1870s — are unequivocally condemned as subversive, and their causes are disregarded. The exhibition was organised by the Russian Orthodox Church, and the Ministry of Education has recently recommended that school teachers use its material in class. 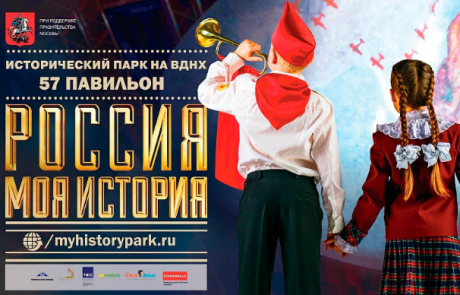 Read: how residents of Makhachkala, Dagestan are resisting plans to build a patriotic history park in the city centre. Putin’s stance is readily picked by the political establishment and a broad range of loyalists. The Russian Orthodox Church, which seeks to assert itself as the government's ideological arm, devoted its annual public conference to “1917-2017: Lessons of the century”. The resolution of the conference mentions “the widespread apostasy, the loss of spiritual foundations and Christian moral guidelines, and the deliberate persecution of the Orthodox Church… in the period after 1917.” But, in the reconciliation vein, the focus is not on what actually transpired in 1917, but on the providential forces that enabled the nation to get over those unnamed misfortunes, come together and rebuild. As part of the commemoration of the revolution anniversary, the Orthodox Church plans to carry around Russia a reliquary with the relics of the “new martyrs” — the church hierarchs and priests executed by the Communists and canonised after the collapse of the Soviet Union. Yet, the Church keeps silent on the perpetrators, let alone the Communist regime, which systematically exterminated the Russian clergy. In March this year, a high-ranking Church official spoke against removing Lenin’s body from the mausoleum. Lenin was the mastermind of the mass killings of clergymen, but he is still venerated by the Russian Communist party whose leaders, while remaining Putin’s loyalists provide an outlet for aggrieved Soviet-minded constituencies and thus contribute to national reconciliation. May 2015: members of an excavation team searching for the remains of Soviet soldiers killed during WWII uncover remains of Soviet soldiers in a swamp east of St Petersburg. (c) Dmitry Lovetsky / AP / Press Association Images. All rights reserved.While Putin’s Kremlin draws on the Orthodox Church as the pillar of Russian statehood, it would not upset the Communist party either. And neither would the Russian Orthodox Church. Communist party leader Gennady Zyuganov and the Patriarch of the Russian Orthodox Church dismiss their past differences as minor and cordially greet each other. There’s barely anything unusual about re-interpreting the past for nation-building purposes. And national reconciliation is, of course, a worthy goal. A peculiar feature of Putin reinterpretation of the Russian history is its uncertainty. His “reconciliation without truth” project is based on avoiding facts and names and reducing the role of people to either unquestioning supporters of the powers that be or dangerous troublemakers. Except for the genuinely shared pride in the victory of World War Two, Russia still has no consensual historical narrative or nationally recognised heroes. This uncertainty may be seen as an asset as it provides the regime with elasticity and a freedom of ideological maneuver. One can glorify Stalin, Leonid Brezhnev, or Russian monarchs and princes, worship the last Russian Tsar Nicholas II and celebrate the early Soviet secret police who executed him and his family. As long as the message remains anti-western, anti-liberal and implies full allegiance to the Russian state, the regime can keep all these dissonant voices as its supporters, not opponents. And yet, the absence of a shared pantheon of national heroes has engendered bizarre ideas. For instance, the governor of Oryol had a statue of Ivan the Terrible erected in his capital. 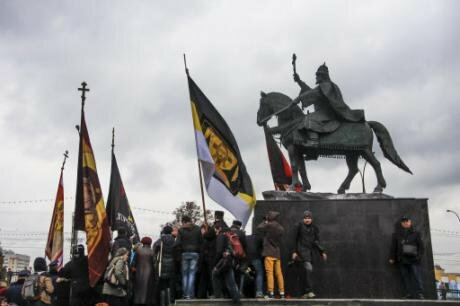 The commemoration of the 16th century Tsar notorious for his brutality had been hardly endorsed by the Kremlin and led to public protests in Oryol — directly counter to Putin’s policy of reconciliation. While the government undertakes to inculcate a single vision of history through school books, history parks, legal constraints and zealous loyalists, professional historians created the Free Historical Society which, in the words of its member Ivan Kurilla “wages counter-attacks to defend their professional integrity”. Russia’s first monument to Ivan the Terrible was recently unveiled in the town of Oryol. (с) Howard Amos AP / Press Association Images. All rights reserved.The obfuscation and evasions of the official discourse every now and then provoke historical initiatives that offer a distinct vision where the official discourse remains blurred. Such initiatives range from new Stalin statues erected locally by his staunch admirers to “The Last Address” activists who install memorial plaques on the buildings from which Stalin’s victims were taken away to be executed. Putin is evasive on Stalin, but the Communist dictator is still buried next to the Kremlin wall, and Zyuganov routinely lays flowers on his grave. The Federal Security Service (FSB), the most powerful agency in today’s Russia, prides itself on being the successor of the Soviet secret police that conducted mass executions of Soviet citizens. In a recent public opinion poll, almost half of Russian citizens surveyed (more than ever in the post-Soviet years) said they had a positive, rather than negative view of Stalin — arguably, the result of the emphasis on the victory in World War Two and Russia’s reinstated greatness. Meanwhile, Putin has ordered a memorial to victims of mass repressions to be built on Moscow’s Andrei Sakharov avenue. Sakharov, a renowned designer of thermonuclear weapons who became an uncompromising opponent of the Soviet government, is a name that is hard to accommodate with the current discourse of unity and reconciliation. Although Moscow has a street named after him, for the Russian public, he is not regarded as a hero and is barely mentioned at all. The “social, political and civil concord” that Putin claims to have achieved draws, first and foremost, on his own uncontested power and overwhelming public support. He is the only undisputed inhabitant of Russia’s post-Communist pantheon. “If there’s no Putin, there’s no Russia,” a senior Kremlin official said in 2014. Which is tantamount to admitting that Russia’s post-Communist identity is still blurred and new, yet unknown turns in nation-building lie ahead.